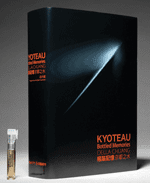 Speaking of Kyoto, Japanese aesthetics, and scent, this book+perfume project by Della Chuang—with fragrance design by Christophe Laudamiel—looks intriguing. Nathan Branch has the skinny. Thank you so much for the encouragement. I would like to send you a copy of KyotEau. Would you please provide me with your mailing address? Yes, Avery, you should totally give her your mailing address! It's a good read and an excellent insight into the design process. And you and Ms. Chuang live in the same neck of the woods. If you ask nicely (and she's not jetting off to Helsinki), you might just be able to score an appointment to see the actual prototype for her stunningly beautiful box and bottle. I was in NYC this past weekend and managed to meet up with Della to talk about her KyotEau project and how it came about. I hope her concept sees its way fully to market -- it's truly a pleasure to sit in the presence of art and the artist. Thanks for the gracious offer. I've emailed you the address. Powerful recommendation; now I'm really psyched to see this project.